I’d hate to think of living in a world without Chai Tea Lattes, but having said that, a bad Chai Tea Latte makes me want to curl up in a corner and cry. While finding a truly great Chai Tea Latte in coffeehouses can, itself, prove challenging, making one at home can be almost impossible. Fortunately, there are a few concentrates out there that actually “get it.” They understand that a Chai Tea latte should taste exotic and distinct. They “get” that one sip should take your taste buds to a beautiful far away land and they “get” that drinking a chai tea latte should be an experience. A very special experience. Did I ever tell you I was obsessed with Chai Tea Lattes? Firepot Nomadic Tea “gets” Chai Tea and Chai Tea Lattes as well as anyone could possibly get them. 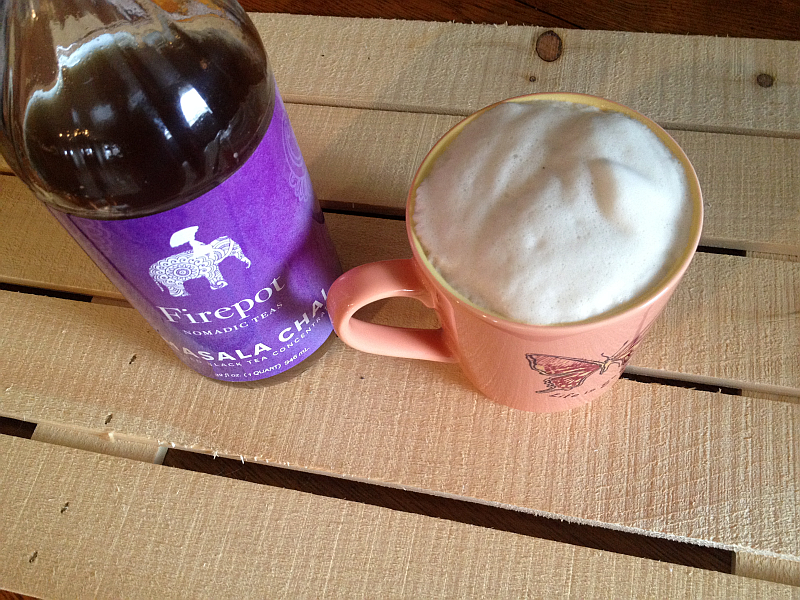 I made my first Chai Tea Latte using Firepot’s Masala Chai Tea concentrate yesterday. By the time I made one this afternoon, it was my third. You could say I kinda freaking love them to the point of wanting to buy a new cat just so I can name him Firepot. If, like the Crazy Tea Chick, you experiment with a lot of different Chai Teas and Chai Tea Lattes, you know that – like people – each has its own distinct personality. You’re also well aware that – again like people! – some personalities are more pronounced and agreeable than others. I recently had a Chai Tea Latte in a beautiful little coffee house that was totally devoid of a personality. Reminded me of some people I’ve met. I vowed to avoid their Chai Tea Lattes in the future like I avoid the people it reminded me of. Firepot’s Masala Chai Tea, by contrast, is loaded with personality. If it were a human, it’d be the life of the party. When I go to coffeehouses, I almost always order a tea-related drink. I guess that’s the sort of thing you’d expect from a Crazy Tea Chick, right? But there are more methods behind my madness than just being obsessed with tea. I live with my own personal barista/coffee expert. My husband, in a stroke of beautiful luck for me, has a couple of hobbies he’s especially passionate about. Coffee is one of them. While I don’t benefit from his love of golf, I benefit daily from his great knowledge of and appreciation for coffee. He brews our coffee each day (with various methods he selects for each coffee bean). So… you know… why bother ordering coffee if great coffee is already part of your daily routine? As someone with asthma, I’ve found that a piping hot Chai Tea Latte almost always clears me up when I’m having trouble breathing. I just make a Chai Tea Latte and normal breathing is restored by the time I finish my cup. I’m one of those annoying cold natured people who seldom think the heat can possibly be set high enough. If I’m not toasty, I’m not convinced it’s warm enough. Chai Tea Lattes actually warm you up from the inside out. Try one on the next really cold day. I promise you, you’ll feel like you’re sitting beside a fireplace enjoying a beautiful drink. That’s what I call the Chai Tea Latte experience. Inspired by an ancient recipe from Northern India, our masala chai (meaning spiced tea) has won the hearts and captured the tastebuds of Firepot devotees for almost two decades. Our exotic and aromatic spices are hand-blended and freshly ground for a uniquely vivid and balanced taste. Read More…. 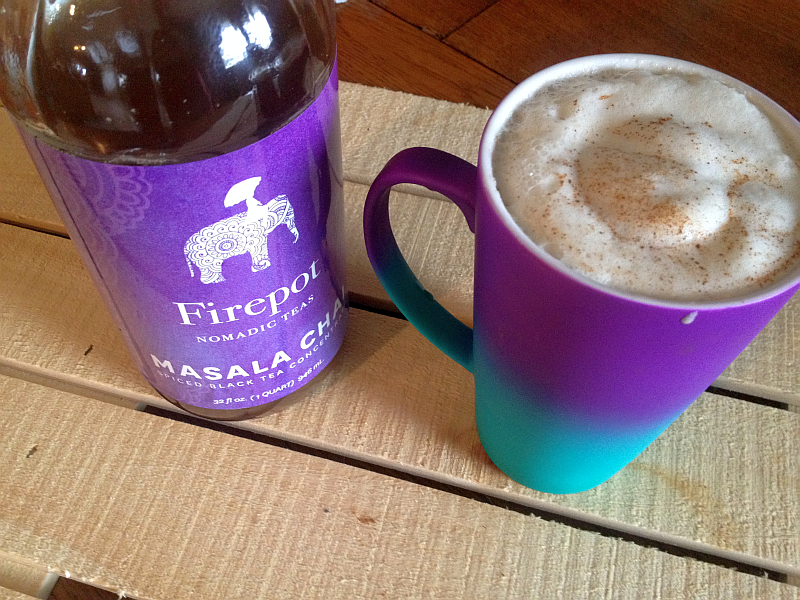 Making a beautiful, exotic, and insanely flavorful Chai Tea Latte in your own home couldn’t be simpler with Firepot’s Masala Chai Tea Concentrate – you simply combine equal parts of the concentrate and milk (skim, whole, Lactose Free, soy…) in a saucepan and bring them to the desired temperature you’re looking for. You could, of course, also simply drink the Chai Tea Latte cold. To add a little loveliness to the production, you could top it off with a small amount of whipped cream or frothed milk. I actually make all of my Chai Tea Lattes in a Breville Milk Frother (pictured in the sidebar). I pour in 1 cup of the concentrate and 1 cup of milk, push the button and wait semi-patiently with my cup in hand. In a wicked short amount of time, I have a frothy, delicious, piping Chai Tea Latte. And when the Chai Tea is as excellent as Firepot’s is, it’s truly a beautiful thing. 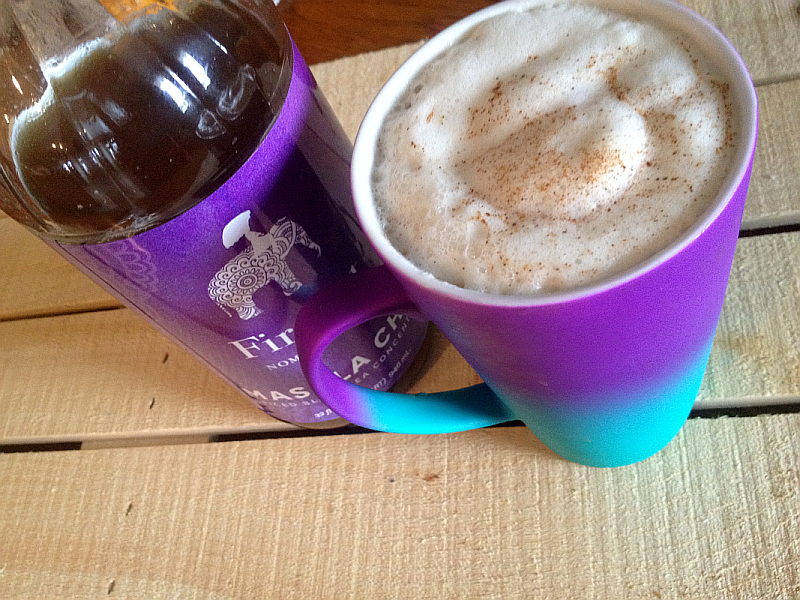 Sometimes I top Chai Tea Lattes off with a little cinnamon or nutmeg. I did so with Firepot’s Masala Chai Tea the first time I made it (pictured in the purple gradient mug). However, by the time I made it the second time, I realized it needed no help from me or my cinnamon or nutmeg, so they stayed in the cabinet. Firepot Masala Chai Tea is packed with beautiful layers of flavor. Each sip is a total and complete experience and makes me fall in love with Chai Tea Lattes over and over again. This Chia Tea fanatic strongly urges you to buy a bottle of Firepot’s Masala Chai Tea concentrate and take your taste buds on an exotic excursion. 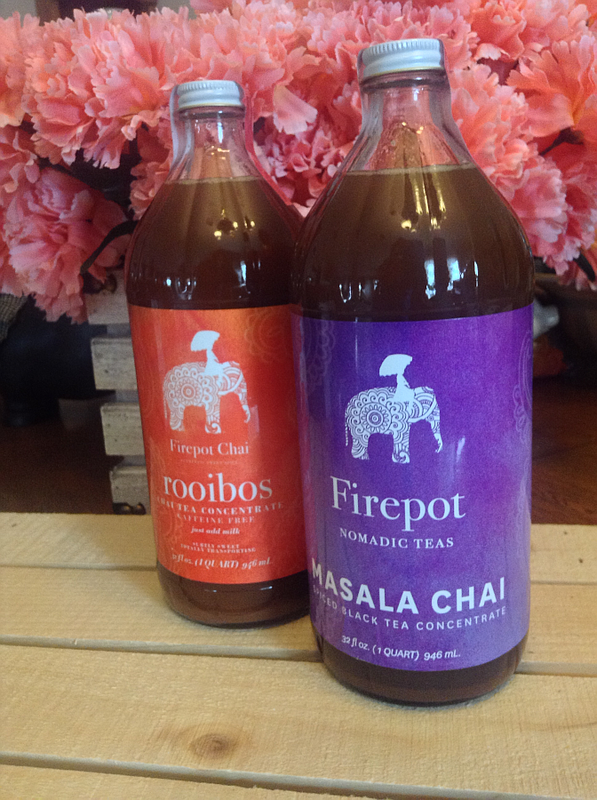 If you’re already a fan of Chai Tea Lattes, you’ll be blown away by the unique flavors Firepot brings to Chai Tea. If you’re new to Chai Tea Lattes, brace yourself – you’re going to have a new obsession.